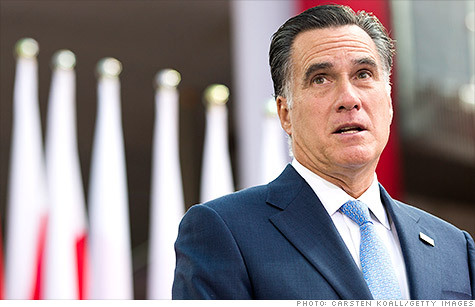 Mitt Romney's economic advisers are projecting strong economic growth and rapid job gains. NEW YORK (CNNMoney) -- Mitt Romney's economic advisers issued a rosy set of projections Thursday that predict 12 million new jobs and a sharp economic expansion if the Republican candidate were to capture the White House. The paper, authored by four conservative economists, projects that over the next decade, the Romney plan would add between 0.5% and 1% per year in gross domestic product growth to the 2.5% annual growth rate the Congressional Budget Office currently projects. The estimates, the economists write, are "conservative." Growth could be even stronger if hard-to-model gains from more effective regulation and decreased policy uncertainty could be captured. Yet 12 million new jobs over just four years would be one of the strongest periods of employment growth in recent history, and require the economy to consistently add 250,000 jobs every 30 days for 48 straight months. According to the position paper, the quick turnaround would be spurred by the lower tax rates and drastic spending cuts that are the hallmark of Romney's plan. The implementation of Romney's plan will of course require the cooperation of Congress, and it should be noted that presidential campaigns often make promises that fail to materialize. The paper's authors -- Glenn Hubbard of Columbia, Greg Mankiw of Harvard, John Taylor of Stanford and Kevin Hassett of the American Enterprise Institute -- also include a boilerplate critique of the Obama administration's policies. "America took a wrong turn in economic policy in the past three years," the authors write. "The United States underperformed the historical norm shown in the administration's own forecasts, and its policies are to blame." Much of the critique is focused on what the authors characterize as a pursuit of short-term patches -- such as the stimulus -- that failed to address deep-seated structural problems like an overly complicated tax code. The paper criticizes Obama's housing policies, for example, saying the administration "ignored" the weak market. But Romney has not offered a detailed alternative -- and the paper does not shed any light on the candidate's plan for the housing market. And while the projections are spelled out in detail, the paper does not address any of the bubbling criticisms of Romney's economic plan. According to a study released Wednesday by the Urban-Brookings Tax Policy Center, Romney's plan would provide large tax cuts to the very wealthy, while increasing the tax burden on the lower and middle classes. Romney's tax cuts would produce a $360 billion revenue loss in 2015, and offsetting that would require a reduction of 65% of all available tax expenditures, according to the study. The end result is that individuals who make less than $200,000 would actually have to pay $500 more, on average, in taxes -- a 1.2% decrease in after-tax income. Meanwhile, the after-tax income of individuals who make more than $1 million would increase by 4.1%. The campaign disputed the Tax Policy Center's conclusions, arguing that increased growth resulting from corporate tax reductions was not included. The Tax Policy Center, meanwhile, said it could not score the plan directly, as "certain components of [Romney's] plan are not specified in sufficient detail." The notable lack of detail is a critique that has dogged the campaign for months. On the spending side of the government ledger, for example, Romney has promised to reduce federal spending from 24% of gross domestic product to 20%. But has not offered a comprehensive list of programs he would cut.